An absence of ability to upload stats to Running Free has lead to me just doing stuff on my own, enjoying it and getting on with things, really. I finished last year with an detached run distance of just over 6 miles which, combined with only 3 runs being over 7 miles and no runs after April of under 6 miles means, yep, I just about ran a while year of 6 mile jogs. This year I’ve already mixed it up more with a couple of hilly interval repeats, a 7 miles outing and some shorter distance cross-country jogs, which I’m enjoying. Also finished the year and am carrying on with some more upper body strength work, plus some bmx and mountain-bike fun. So yes, active, just not involved! I plodded off along the Greensand Way with the thought I’d enjoy seeing the fields and countryside before the 5,750 houses are built. It’s truly criminal that, in 20 years, none of the run I did will exist. 7 miles of enjoyment with a little tint of sadness for the future. Went for a jog up the Greensand Way towards Singleton late this afternoon and got caught in a shower. Right at the highest point, right where I turn around on a short jog, it started hammering down. And after plodding through the now yet corn, the soaking grass past the horses which were again scared by my passing, I came to the long corn field and upon the oddest run yet. The rain was accompanied by wind which made half the track wet (it’s a well maintained route through the harvest this time of year) and kept half dry. 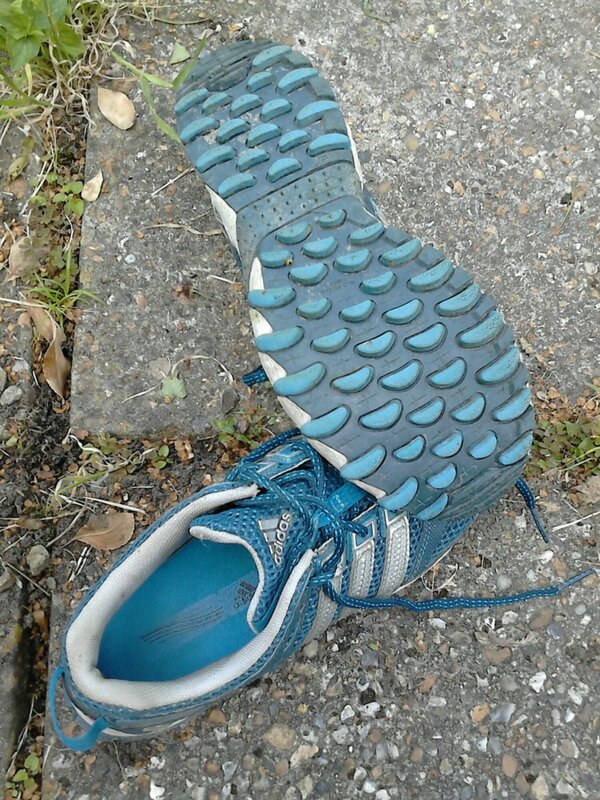 Which made my left shoe stay clean but the right gained weight with every stride until I attained quite a lop-sided gait. Incredibly odd, I’ve never quite had such a similar wobble. Which made the next field which was long very wet grass oddly welcoming to clean the mud off. One more run to go and June is done. An early start upset me, a good day cheered me, a decent ride on the motorbike encouraged me and I decided I’d run until 6 whenever I set off. Which turned out to be 5.20, so 5 off-road miles ensued which were less fizz and more slog. Sadly pretty, the views aren’t to last-the last date for planning appeal against the 5750 (yes, best part of six thousand! Plus schools and shops) houses planned for the fields was yesterday. But the infrastructure has been in for 20 odd years so it’s a bit of a sham, really. Guess I’ll soon have to head SouthEast instead of West on my runs to avoid the blight. Yesterday resulted in a jog around the local lanes to flog out 4 miles and remember what it’s like to run in decent warmth. With two pauses to tweak my right ankle/heel/achilles which decided to announce a little pain around half a mile, then 3 miles into the jog. But enough to make me think twice about a run today, even though I was going to ease around the local bit of the Greensand Way, which is a shame to pass up when it’s dry. So I popped out on the road bike for an extended route to buy some eggs from the local farm gate. I say local-there are several closer places but this one is still only 80p for 6 and, being tight, is my favourite! Well it got me out on the road bike, at least. Gordon Bennett, it only seems yesterday I was moaning about Janathon. I’ve been happy in my exercising this year and have debated June and what it entails so hopefully I’ve got a plan. Run a bit, cycle occasionally, throw some weights around the conservatory once in a while and above all enjoy the summer. It’s the only one we’re going too get, after all. Yesterday had me out on a 6 mile jog to round May out nicely so today, after a good day of dicking about on all sorts of things around the house, I plodded off up the Greensand Way to tap in 3 miles of easy, scenic off road enjoyment. As a result, my legs feel fresher, I’m relaxed about the world and ready for a jog along the river in Rye tomorrow after work to keep the legs free. Planning on throwing the weights about in a minute, too, so the year’s exercise target isn’t completely in tatters yet. I promised myself a trail run and that’s what I set out to do, albeit about a half hour later than intended. Which was a bit of a pain since it was hammering down with rain all the way around and pretty much pitch black (and not in the Vin Diesel film style, clever clogs!) once I got home. But the run was fun. Out up the local lane to the Greensand Way where the first field was pretty much completely under water with three trees blown over with another two over the stiles at the exit. I fear the landscape is going too look a fair bit different next spring. The next field was ankle deep water throughout, the two little bridges as slippery as eels, the next field so soft I think my vertical distance might match my horizontal! Pretty much every ditch is overflowing and the last gate was more a hurdle to try to clear the half-shin deep water. I didn’t quite manage it. And then it really started hammering with rain,I had to take off my glasses, so useless were they and thus I turned tail for a repeat of the same to home. With added dark too join my lack of eyes. But it was so slow, my legs once more feel fresh as daisies and at least it wasn’t a dull road plod. Shame the last field was so wet it cleaned my trainers so the photo is dark, useless and uninteresting. Much like me, I hear you cry.